The preview performance of "Sabi kara deta mi / Fruits borne out of rust"
Tabaimo is known for portraying various social issues in Japan through her humorous video works and installations. Maki Morishita, a Choreographer as well as a dancer, is known for borderless collaborations with theater, music, fine arts to manga. The 2 female artists who share the same birthday, home town, blood type, and sister constituents, will re-create their collaborative dance performance “Sabi kara deta mi / Fruits borne out of rust”, which was first shown in 2013. 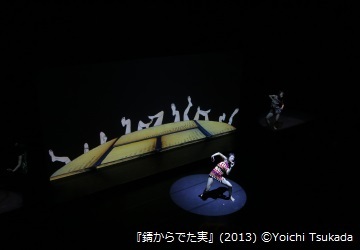 In contrast to the first version where Tabaimo was only in charge of the stage decoration and overall concept, she will cover the concept, direction video work and space design in this version to reconstruct the previous artwork. The video play “Sabi kara deta mi” will be a live collaborative video performance where artists from various fields ranging from dance to video and music will collaborate on stage. A demonstration of the work is scheduled to be shown during Tabaimo’s latter half of stay as part of the result briefing of the artist in residence program.